Where do your creations live? The challenger will say "I challenge _________ to make _________"
Woot! As you probally know already I love a good craft challenge! I challenge *Panda.goes.rawr* to make a *cute coin purse*! I challenge *CraftyGeek* to *sculpt a rubber ducky out of pennies*! I totally accept! Yey now i have a project to do tomorrow!!! Monika I accept!! That is an awesome idea I have loads of pennies laying around. I challenge Monika Göttindóttir to make a necklace out of recycled materials! I challenge Cassie B. to make something out of socks! ANYTHING! Ok ladies! My project is done! Its just waiting approval now. 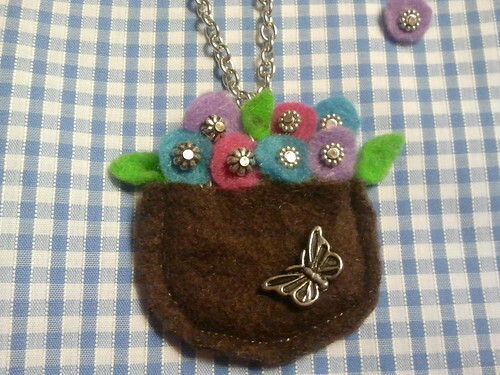 I decided to do a version of Flower Basket Pendant by Caeli L.